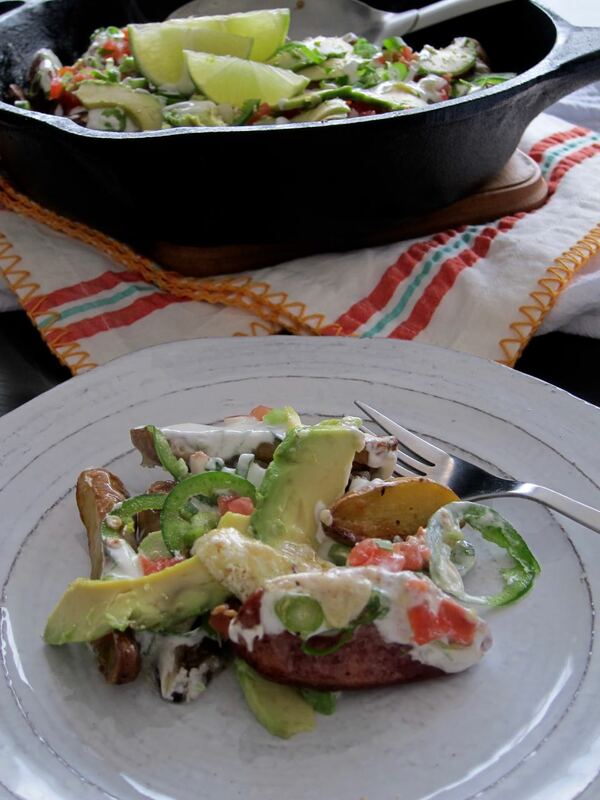 So these loaded potatoes are maybe a few days late for Cinco de Mayo, or maybe they are right on time for Taco Tuesday? We have no tacos in sight, but we have a lot of toppings that can go in a taco, so I'll allow it! 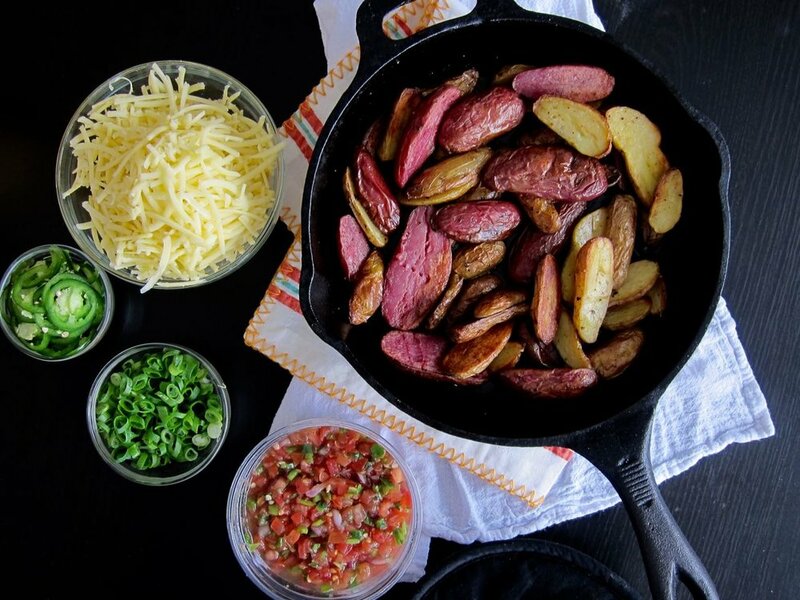 Just take all the delicious things you would pile into a taco, or better, onto nachos, and then even more better, pile them onto crispy, hot roasted potatoes, aka home fries. It's jalapeños on salsa on cheese on carbs and I love it. The potatoes soak up any juices, don't get soggy, and they stay hot while you eat them. It's nachos, but better. It's totchos! These make a killer brunch dish (you could even bake some eggs right on top of the potatoes) or side dish, or just an "I want a snack dish" but I think the important thing to note is that these potatoes are truly perfect for any time of day you crave cheese and spicy things on top of carbs. Heat oven to 500 degrees with a rack in a low position. Place a cast iron or other heavy skillet in the oven to preheat. Bring a large pot or water to boil, add the potatoes and baking soda. Cook for 2 minutes, then drain. Return the potatoes to the pot over low heat, the cook 2 minutes until the moisture has cooked off. Remove from heat and add the butter, salt and cayenne and stir until well coated. Remove the skillet from the oven and drizzle with the vegetable oil. Add the potatoes in an even layer and roast for 15 minutes. Remove from the oven, scrape and flip potatoes, and roast another 15 minutes. When ready to serve, sprinkle with cheese, and return to the oven for 2-3 minutes to melt the cheese. Remove from oven, mix together the sour cream, lime juice and zest in a small bowl and drizzle on top of the melted cheese. Top with remaining desired toppings and serve immediately.